Choose the billboard market area you're interested in from the grey Billboard Locations box. Sign in and plan your campaign. Sign into your account and plan a billboard campaign. Choose a start date and the level of advertising coverage your business or organization needs. Get billboard rental rates plus design, production and installation pricing information. Get current billboard availabilities and a price package for the campaign you've selected. 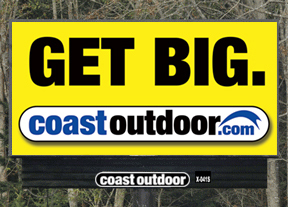 Get a great looking billboard in the air and working for you. Work with us to design, produce and install an effective billboard that will best represent your message. Coast Outdoor offers a full range of billboard services which include stepping our clients through each phase of the development of your billboard campaign: from design and production of your billboards to installation on one of our billboard locations. You can take full advantage of our experience and expertise or use your own creative team to develop your billboard campaign creative.